At the time of this writing, the opportunity to see Antigone: The Burial at Thebes by Seamus Heaney produced by Furies Theatre Company has passed. Unfortunately a tight season for the play and an enormous imposition of real life for me coincided but I wanted to continue my review, because this is a stunning debut by a small theatre company who appear to have a lot of talent and wit in their ranks and perhaps you will get a chance to see them perform this piece in the future. According to the program notes, fellow creatives Krystiann Dingas and Emilia Stubbs Grigoriou thought long and hard about how to begin the life of a theatre company, and eventually decided upon the story of Antigone and her moral (or is it spiritual? Political? feminist?) battle with Creon, king of Thebes as interpreted by Seamus Heaney who wrote his version of Sophocles ancient Greek theatre piece about ten years ago in response to similarities he saw between Creon and the Bush Administration. These observations inevitably give rise to questions about the nature of human creatures and their remarkable capacity to appear to have learnt nothing in hundreds of years, but also this is an observation that centres on the nature and dangers of dogmatic belief systems and the futility of universal law. Every law, immediately uttered, gives rise to its exceptions and it is inside the exceptions that the opportunity arises for the spirit of the law to be practised or the letter of the law to be adhered to. In the story of Antigone and Creon, both display their own version of dogmatism, but as we see in the play’s duration, each case needs to be taken on its merit, because sometimes a break in law is an opportunity to include the shades of gray that, if properly administered, give rise to a more powerful legal structure. However, it is a courageous act to be able to examine the law in light of a particular case and find the rule wanting, so Creon will eventually see that in upholding the law he becomes powerless and a fool in the eyes of the people he was trying to so tyrannically rule. Sound familiar? Seamus Heaney certainly saw shades of our current leaders in the character of Creon. Antigone, whom Creon condemns to death, despite the generosity, love and faith underlying her act of civil disobedience and despite her being his sons fiance, is his path to a broader way of thinking, but as in this current day, if the law can’t be manipulated in the courts to mean something other than what it does, there is no place for refusing it. Think of Rosa Parks when you think of the importance of civil disobedience. In our current day the law impacts as a kind of micro manager, legislating the minute details in everything from the way essential services such as telephones distribute expensive products through to the food we are allowed to serve our families. An alert community questioning every new piece of legislation is as important to the law as lawyers and yet there is so much new legislation slowly corroding our personal freedoms, we barely notice them, much less have the time and energy to oppose them. This is the essential matter at the heart of the story of Antigone and Creon and this is why it is more relevant today than it even in the times of the ancient Greeks. 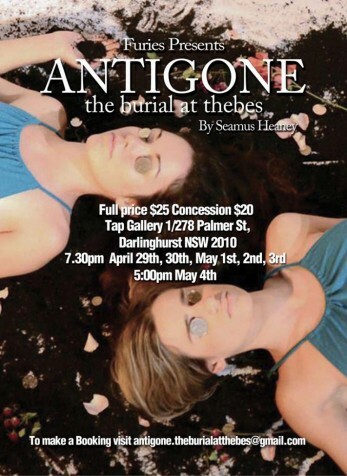 Krystiann Dingas and Emilia Stubbs Grigoriou share the roles of Antigone and Ismene in this wonderful production. Both bring an other worldiness to their roles, playing down the spiritual nature of the burial of their brother in preference for a moral obligation. This hurtles the dilemma into a modernist age where the battle is not between the law of God and the law of Man but rather a question of doing what is right when you know the ruler is wrong. Brendan Layton is a formidable Creon. He has a commanding presence that again, brought a very contemporary vision to his style of rulership. His masculinised ferocious passion for his laws seems to have the seeds of violence in it, and it is with his declarations that Antigone immediately knows she will die. Director Chris McKay pulls fantastic performances from all the cast, particularly Peter Jamesion who performs beautiful monologues. I could watch and listen to him for hours. In a set that looks like a dark cave, created by Lucy Watson, the nether world of Thebes is a kind of hazy purgatory, partly the cave Antigone will die in, partly the suffocating rocks of our own rule of law. Antigone, The Burial at Thebes was an ambitious first production for a small theatre company, but this project was so well performed, with all the cast and creatives havign such a strong command of their subject matter that all the complex stages and multiple messages of this fantastic play could be plucked easily for any thinking theatre lover. It was a completely engaging performance that had me entranced and on the edge of my seat. It will be exciting to see what Furies Theatre Company come up with next.